A smart blend of cutting-edge design and unique lens materials, Avaira contact lenses at Mister Spex offer all-day comfort, crystal clear vision and enhanced protection. Presented by CooperVision, one of the leading manufacturers of eye care products, these lenses are soft, breathable and moist, promising extraordinary lens-wearing experience, from morning till night. Additionally, it is also highly-helpful in blocking harmful UV rays. 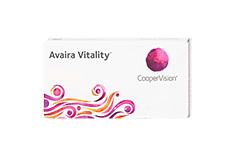 Avaira contact lenses at Mister Spex are available for a range of eye conditions. Avaira and Avaira Toric are the two different products sold under this label. Ideal for nearsightedness and farsightedness, Avaira contact lenses feature naturally-wettable, Silicone Hydrogel material and unique Aquaform Technology, so that your eyes get plenty of natural oxygen to stay white and healthy. 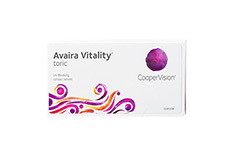 Avaira Toric is a great choice for those suffering from astigmatism. Boasting Optimised Lens Geometry design, Avaira Toric contact lenses are renowned to provide stable and accurate fit, ensuring absolute comfort and visual clarity, be it near or far. With our professional online opticians available to help you choose the right eyewear, you can never go wrong while shopping for Avaira contact lenses at Mister Spex, Europe's most popular online optical store. We also guarantee easy returns and fast door-step delivery to make online purchasing a worry-free and hassle-free experience.